Every product I use is FDA compliant and are professional face painting products, water based and safe. The glitters I use are all cosmetic grade and safe to use near the eyes. • All professional face paints used have anti-bacterial properties and are specifically for use on the face and skin. 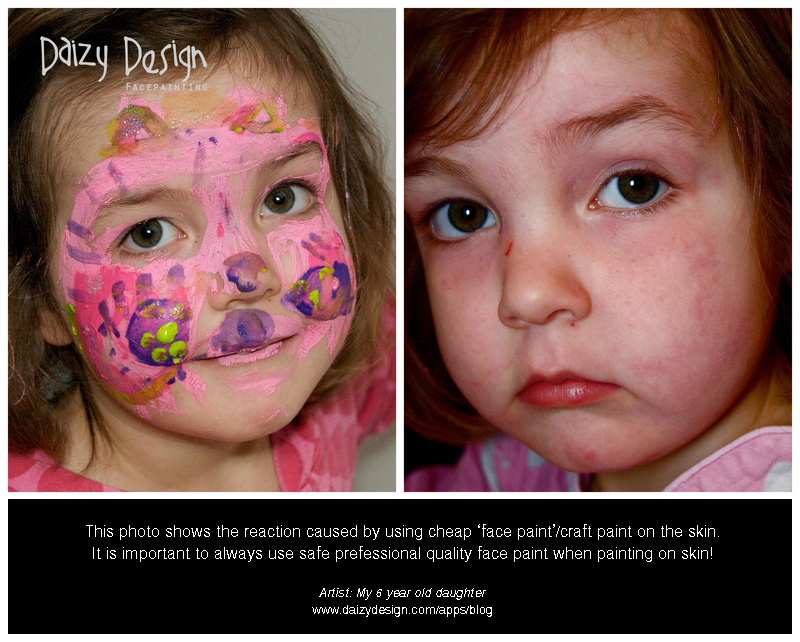 Face paints are easily removed with face cloth and mild soap & water. • Face painters should not paint anyone who does not want to be painted. • Children should be well supervised (by a responsible adult) and not left unattended while they are waiting, to avoid disruption. • Children (and their actions) remain the responsibility of their parents or party organizers at all times. • For sanitary reasons, I will not paint anyone who is or appears to be sick or suffering from cold sores, cold or flu, ringworm, sunburn, eczema, any infectious skin condition or open wounds. Glitter Tattoos are created using medical grade adhesive and super fine cosmetic glitter. Each design will last 3-7 days, assuming no lotions are applied and the design is not scratched. Glitter Tattoos will wear off over time, but can also be easily removed by soaking it with rubbing alcohol or alcohol based lotion and then rubbing off with a cloth. Glitter tattoos should not be applied to the face or to anyone with sensitive skin. It is very important to understand that while craft paints like Acrylic, Tempra, or Watercolor paints are Non-Toxic and safe for use BY children, that does not mean that they are safe to put ON children. Even craft store brands of liquid “Face Paints” are not professional grade and are not properly tested to be safe on the skin. The picture below is a great example of what happened when two sisters found their moms craft store liquid paints, which WERE marked as “face paint” and got creative. After an hour or two the paints began to irritate the girl and the result was a rash all over her face. Please be aware of this when you are out and about and see anyone using craft paints on children.